The SV-1200 Series has been discontinued. Please contact our Flow Engineering Department for possible alternatives. SV-1200 Series miniature solenoid valves are ideal for applications in analysis technology, reliably handling difficult liquids such as acids, bases, pharmaceutical elements, and fluids in biotechnology processes. 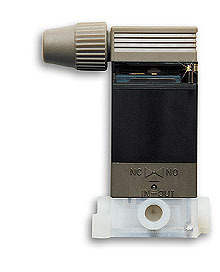 Thermal isolation of the actuator and fluid ensures accurate measurements for metering applications. A perfluorelastomer separation diaphragm hermetically isolates the fluid medium from the actuator. Other features include universal functions, small size, and simple and fast electrical connection to reduce installation costs. An LED provides safe and convenient monitoring.